This one may seem obvious, but you would be surprised how many social media pages have incorrect or out of date information. Did you recently change offices or store locations, add any new services or update your mission? Be sure you are updating your phone numbers, address, URLs, email addresses and all other relevant information. If information is incorrect or inconsistent between different social media platforms, a potential lead will loose trust in your brand fast. Not to mention if they try to call or visit your business and it comes down to simply not being able to find or get a hold of you. So, it's important to take the time to review review review! If potential customers can’t find you, they will always be just potential customers. Using a template like the Social Media Audit Template is a great way to do a little social media housekeeping. Currently 60% of small business owners are not able to track ROI from their social media activities. To avoid this current hang-up, use call to action's to take people directly from social media page to whatever it is you are trying to get them to do. 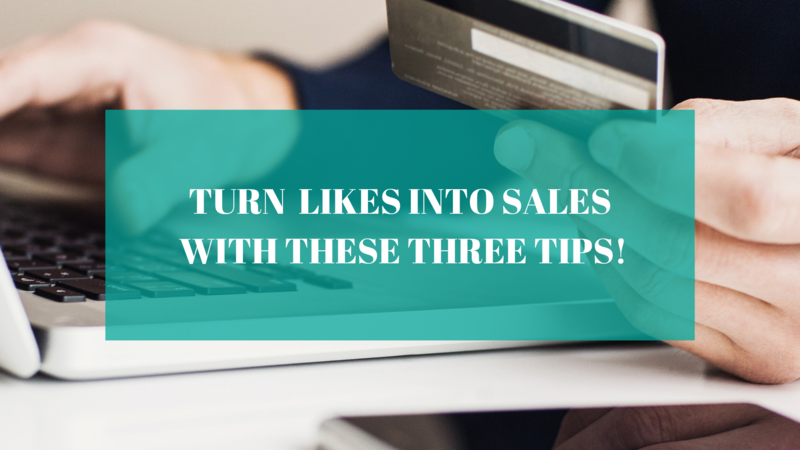 When using social media as a sales tool it's important to make your call to action seamless for the user. As we wrote in a previous post, your copy should be direct and to the point, and the intended action should be clear. Let your potential customers know why they should buy your product or become members or donate to your organization, then provide them a DIRECT LINK to your websites purchase page. If you are trying to get them to attend an event, use tool like Facebook Events, so they can purchase a ticket, or show interest in the event with the "I'm Interested" button. Using call to action's will allow you to actually track your ROI, so you can assess your social media strategy later on. This is time consuming but may be the key to really converting followers into customers. According to Lyfe Marketing, 59% of Americans believe that customer service through social media has made it easier to get their questions answered and issues resolved. When a person takes the time to message or comment, it makes them a lead for your business because they have demonstrated a clear interest in your company or organization. Messaging them back promptly, politely and with the relevant information will almost surely lead to a conversion. Take these tips and you will see an increase in foot traffic, sales, membership and any other goals that are key to your organization or business. Check back later this week to see what we are talking about in action! We will be featuring a case study about local Milwaukee craft brewery that enlisted the help of WSC to turn one giant disaster into profitable social media campaign. You don't want to miss that awesome story! SUBSCRIBE to our blog so you don't miss it!